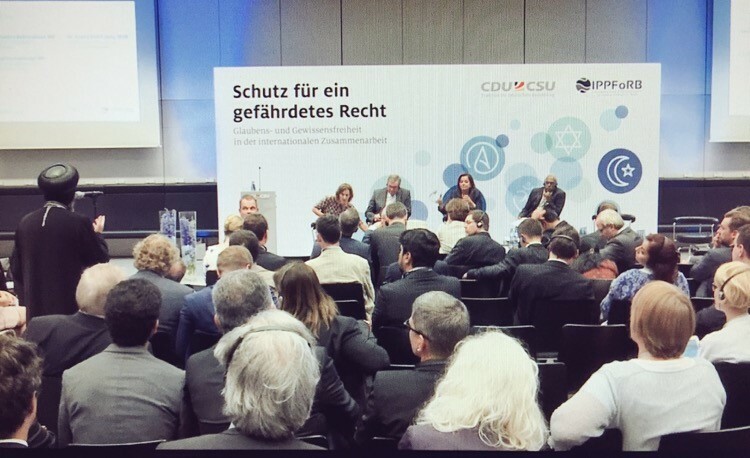 The Second International Parliamentarians’ Conference, organised by the German CDU/CSU party, took place from 12-13 September 2016 in Berlin, and brought together over 100 members of parliament from 60 countries to discuss the advancement of Freedom of Religion or Belief (FoRB) around the world. The Parliamentarians’ conference was followed by a High Level Conference in the German Bundestag, with participants including members of parliament, leading academic figures, religious leaders, including His Grace Bishop Angaelos, General Bishop of the Coptic Orthodox Church in the United Kingdom, and members of the public. The German Chancellor, Dr Angela Merkel, gave the welcome address, in which she spoke of the importance of parliamentarians continuing to champion FoRB in all the countries that they represent. Throughout the conference, speakers highlighted that the need to address FoRB violations that increasingly occur due to the rise of religious extremism, intolerance, and violence across many parts of the world was a global responsibility, also pointing to the positive role that religion can play in promoting social cohesion where intolerance has led to division within communities. “I am attending this conference as a religious leader because I feel that freedom of religion or belief is an issue that is important for all, whether it concerns Christians or anyone else. Religious freedom is a God-given right that we as people of faith must always advocate for, because it intrinsically protects the freedom and dignity which God desires for all humanity indiscriminately as His creation. While listening to all those who have spoken today it is becoming more and more evident that the breadth and complexity of this issue is one that challenges us all, and requires our collective energy and effort to continue to shed a light of hope in what sometimes appears to be overwhelming darkness. 0 Comment(s) to the "Press Release: Bishop Angaelos attends Berlin FoRB conference opened by Chancellor Angela Merkel"